Shameless plug: Perfect Fit will be my first published pattern, and it will be available soon! Hello, my friends, and Happy almost 4th to my fellow USA Dwellers! First of all, thank you so much for being patient with my lack of blogging last week! I'm not really sure what happened-- it was just one of those weeks. It might have also been influenced by the INSANE social schedule the family kept this week. Three dinners, two lunches,, a movie, the splash pad, the aquarium, the pool, and an art museum. Yeah, that might have had something to do with it... haha. Anyway, secondly, THANK YOU to everyone who has already entered the giveaway that was announced last week! You have until THIS FRIDAY to enter on the Week 9 post. All the details are in that post, and I will announce the winner on the blog and on social media next Monday, so be sure to check back! Or, even easier, follow me on Instagram @stringandstory! Well, here we are: the final week of the #MachineQuiltingBlogHop. I have to admit, I'm sad to see it go. It has been a huge commitment of time and energy, and it has been so very worth it. 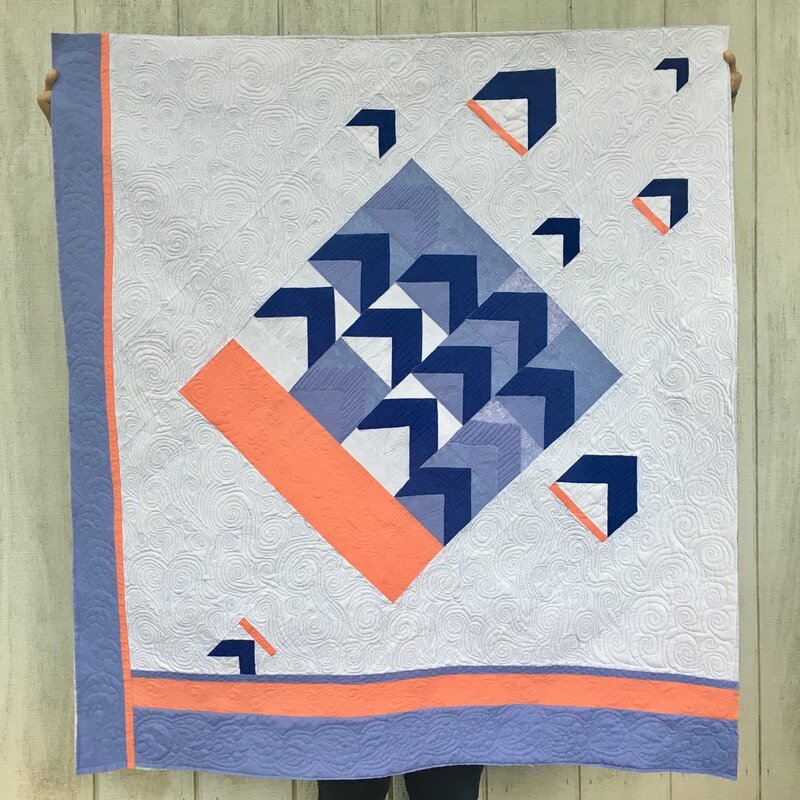 My quilting skills have grown by leaps and bounds, and I've connected with many wonderful quilters, like you! 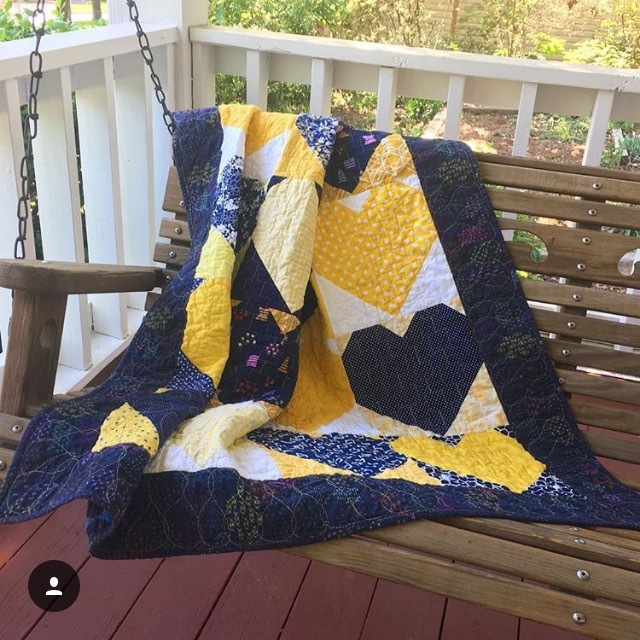 If this is your first time joining us, Jen, Kristin, Vicki, and I have quilted and blogged our way through The Ultimate Guide to Machine Quilting by Angela Walters and Christa Watson. You can see all of my previous posts, link to my friends' blogs, and read lots of fun interviews by clicking HERE or by clicking the blog badge at the end of the post. And, drumroll please, my whole cloth quilt!! Thank you again, everyone, for joining this journey. It's been a treat! I plan to continue posting about my machine quilting journey each week in a new series called #MachineQuiltingMonday. I hope to continue making periodic quilting tutorial videos, and, I'm overwhelmed and joyful to share, that a generous quilter has donated a Tin Lizzy 18 long arm to Quilts for Cure that we'll be picking up next week. The donor has also given permission for me to generally use the long arm, so I'll be starting another Machine Quilting journey soon! That's all for now, folks! I really will be back for WIP Wednesday this week! In the meanwhile, be sure to visit my fellow hoppers, Jen, Kristin, and Vicki! As I mentioned above, stop by the previous blog post to enter the giveaway for a copy The Ultimate Guide to Machine Quilting. Then, follow me on Instagram @stringandstory and subscribe to my Saturday newsletter. PS I've also added the #MachineQuiltingBlogHop Directory as a link in the menu of my website's home page to make it easy to access even now that the hop is done if you want to return to interviews or read previous posts.